Phuket Butterfly & Marine Life has endless educational possibilities in the conservatory. Self-guided tours or you can have a volunteer take you. The Gardens are designed and built specifically for the hosting and breeding of tropical butterflies and moths. You will have an opportunity to see various stages of the butterfly life cycle in action, from live eggs, larvae, pupae and mating butterflies. During your breathtaking journey you will experience an impressive collection of flowering plants, brightly coloured fish waterfalls and trees that set the stage for the indoor tropical paradise. You will enjoy a rare and unique opportunity to enjoy the beauty and dazzling colours of exotic butterflies, flying-free in their own tropical rainforest environment. This butterfly farm contains 40 native species. Some butterflies are always present but others are only available seasonally, so you might see many different butterflies each time you visit. 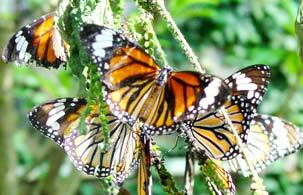 After exploring Phuket Butterfly Garden & Insectarium , visit the Gift Shop. Discover gifts for everyone. It's fascinating for visitors of all ages and truly a photographer's delight.